PLACERVILLE, California (KOLO)-- A plane crashed Sunday at a Placerville airport, the El Dorado County Sheriff’s Office reported. Deputies responded. The pilot got out of the airplane and was taken to the hospital for precautionary measures, the sheriff’s office said. The Cessna 172 crashed under unknown circumstances right after takeoff from Placerville, the Federal Aviation Administration reported. There was significant damage to the plane. The Federal Aviation Administration and the National Transportation and Safety Board will investigate. 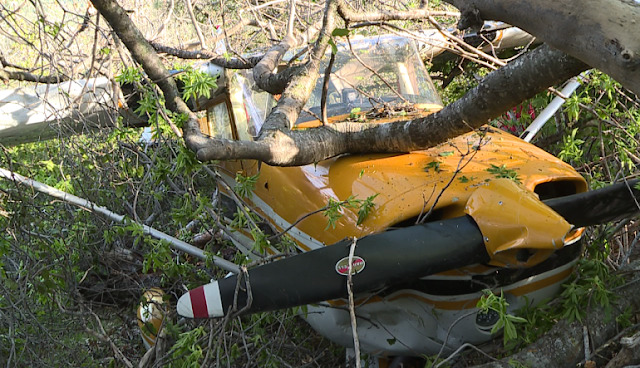 El Dorado County, California -- Two people received medical attention Sunday afternoon after a single-engine plane crashed at the Placerville Airport. The El Dorado County Sheriff’s Office said the pilot and an occupant removed themselves from the plane and were taken to a hospital as a precaution. EL DORADO COUNTY — A single-engine plane crashed at the Placerville Airport Sunday, March 31st. El Dorado County sheriff’s Deputy McElroy reports the pilot was able to safely get out of the plane and was transported to a hospital as a precaution. It is unknown what led to the crash.